The wet and the wind have left the landscape looking dull in its muddy greys and browns. It almost makes it hard to believe that such a short time ago the autumn colors were at their peek. Was this favorite spot of mine really that bright and color-saturated, or did I just get carried away with my creamy yellow paint? This first painting was done October 19th, and the second on the 24th. 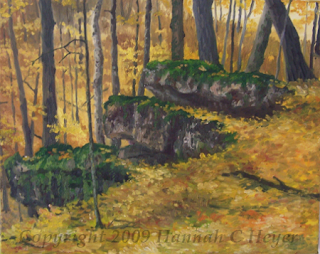 They were done quickly (2 - 3 hours, until darkness fell), on location, en plein air. The first was done on a warm day. 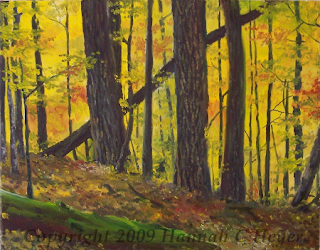 I went alone, and in the quietness of sitting in the woods painting, I got to observe a lot more than I usually can. I even got to see a coyote ambling through, which was pretty exciting. It didn't notice me and I was able to watch it for some time. Then, when it was starting to get a little too close for comfort, and was headed straight towards me, I stood up and it fled. The second time I had a good friend with me, and we made too much noise to go unnoticed by the wildlife. That day was cooler and damp. I was shivering by the time I packed up to go home. The ground was slippery with fallen leaves, wet from the previous day's rain. This particular area is full of tall, old oaks, growing on the steep slope. In their shade, hundreds of young, grey-barked hard maples grow. Their leaves give the beautiful, lush green atmosphere in the summer, and the glorious yellows in the fall, which I was trying to capture. I just started doing Plein Air paintings this year (these paintings being my third and fourth attempt). I have a long way to go in developing my skills, but I'm enjoying the challenge and discipline of this style.